Protect and keep a sick or dying tooth. 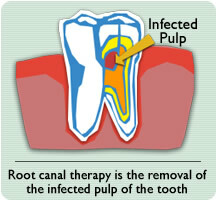 If a tooth is sick, there are no disadvantages to root canal therapy. On rare occasions, however, root canal therapy may need to be redone to ensure that all of the infection has been removed. The only real alternative is to remove the sick tooth. However, this will require a dental implant or bridge to fill the empty space and prevent the shifting of surrounding teeth. These solutions will ultimately cost more than the root canal therapy, and they will never equal the quality of keeping your natural tooth.